Whew! Again this week I'm making it in just in the nick of time....I've been going through stamp withdrawal all week, as I didn't bring any stamp projects to the lake with me! We had a wonderful time, now it's time to get inky again! This week's Compendium of Curiosities Challenge is Inking Grunge - here's what I came up with, using this weeks challenge and inspiration from MTSC85. I die cut the Birdcage from the Grunge, then followed the directions found on page 39 on Tim's book. I inked up the flourish grouping from the Serenity plate from Artistic Outpost in Black Archival to add interest to the birdhouse. I cut away part of the bird cage to add the butterfly. The butterfly is also from this plate, stamped in Black Archival on Watercolor paper then colored using the Marker Watercoloring Technique, and placed on dimensionals. very nice Lisa - you have great ideas! Luvin' it Lisa, Butterfly looks great on/in the cage! LOL! Stamping withdrawal indeed! Well it found a fix with this beautiful card. Love the birdcage and the color behind it is fabulous. I'm so happy you had a nice vacation at the lake. That sounds wonderful! That is my favorite die and I so enjoy what you did with it! Not to mention you used a butterfly!! Awesome as always! This looks gorgeous - love that pop of chartreuse in the background of the cage! Awesome! The cage looks great with the AO bits stamped. That butterfly is wonderful on the cage. Love the ribbon and button at the top and the beautiful blue Pearls? along the bottom of the cage. Hope your trip was relaxing and fun. 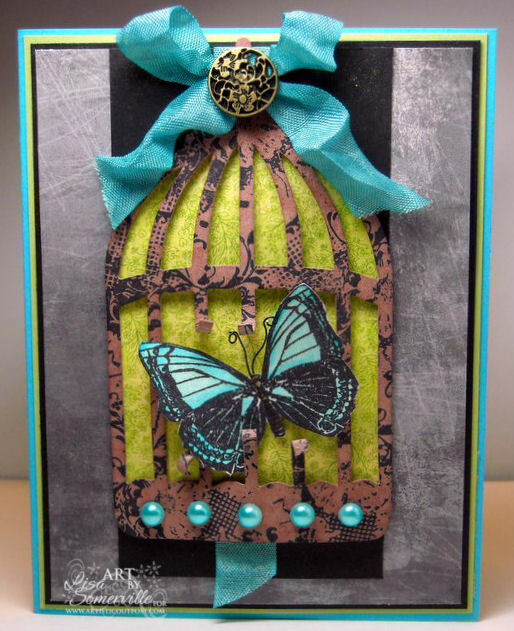 Very pretty card, love the color combination you used on this. The ribbon & half back colored pearls are gorgeous! I just picked up the Compendium book this weekend at Hobby Lobby, so hopefully I can join in the fun ... love your fabulous design.